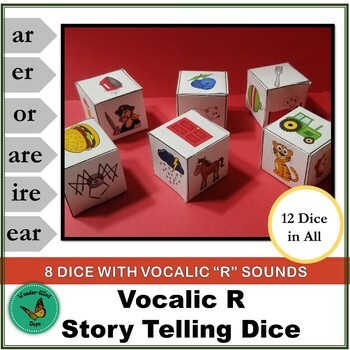 These story telling dice are meant to be used as a fun review for the vocalic r. Have the students roll the dice and make up a sentence with the images on the dice. Each of the first eight dice focuses on a different vocalic r sound. The last four dice do not focus on an “r” sound but can be used if you wish to have sentences that do not contain as many “r” sounds. You can roll as many dice as you want to at one time. For example, if you are working on the “or” sound, you may wish to use only the dice with the “or” words and also one or more of the last four dice. Use more dice for students who have an easier time making up stories. Two sizes of dice are included. Jumbo sized dice that measure about 1 1/2" per side. Dice that are about half that size. They will need to be cut out, folded and glued to form a dice shape. Would you like to get credit toward future purchases? All you need to do is rate your purchase and leave a review. Just go to your “My Purchases” page and click on the “Provide Feedback” button. Your feedback is valuable to me and helps me to make the best possible product. Don't forget to follow me to be notified of new products! You'll be surprised how much your students will learn while having fun. We did!